Content Requirements enable Administrators to enforce maximum and/or minimum numbers of different content types on a Portfolio section. Unless the Content Requirements are met, the Submit button will remain inactive. This lesson will walk you through the process of adding content requirements to a Table of Contents section. 1. Click on the section of the Table of Contents to which you would like to add Content Requirements. 2. Click on the Content Requirements tab. 3. Enter the Minimum and/or Maximum numbers of files for each Content Type. 4. 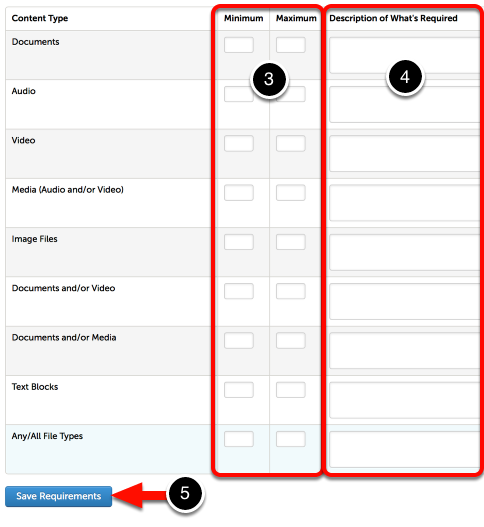 Optionally provide a Description of What's Required for each content requirement. If you do not want to enforce a given category of content, leave the minimum and maximum fields empty.